I keep having to revise my favourite poem in the 2011 collection! Loved this, AND Trouble Fly. Singing in a choir is a natural high for me, making each nerve ending vibrate. I don't think I've ever read a poem about a kid singing in choir -- we choir folk don't get much airtime, but airtime for writing AND choir -- now, that is excellent. I love the new logo for 2011and the poetry posted so far. Congratulations on the entire enterprise. 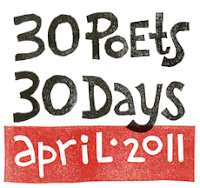 I blogged about 30 Poets 30 Days today at Bookmaking With Kids. Here's the link. Oh, I love the stadium under the blanket! This writer is so real...I want to read more from this child-voice. Thank you, both Susan and Greg! A. Just heard the children's choir perform Susan's poem. Wow!!!!! What an honor.